A perfect smile can make all the difference to your self-image. If your teeth are chipped, spaced or discoloured, or if you simply want to have an eye-catching smile, a visit to the Landry Denture Clinic can help. Dan Landry has been a part of this family business since 1991, and is now the owner of three busy offices. While the implant technology has continued to evolve, one thing remains the same, the desire for that perfect smile. “I love to meet with individuals to share the different ways we can improve their smile and the way they will feel with their new teeth knowing that when they go to a restaurant they won’t have to avoid the food that they really want to eat because they can finally chew properly,” says Dan. There are many different levels of comfort you can achieve with implants depending on your budget. However, the results are worth it! Imagine being able to chew your food and feel better physically because your body is able to digest food properly. 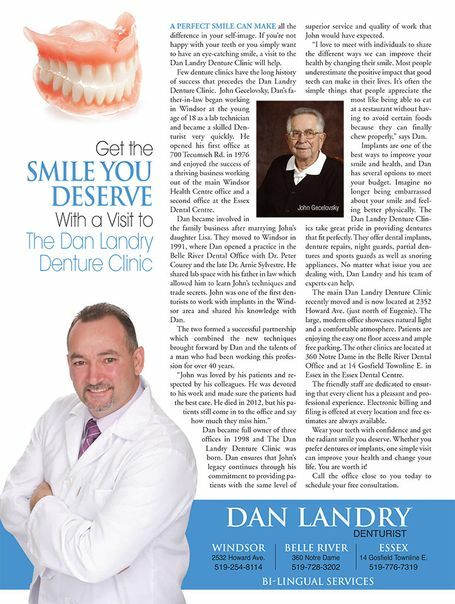 The Dan Landry Denture Clinics take great pride in providing dentures that fit perfectly. They offer dental implants, denture repairs, night guards, partial dentures and sports guards. The first office opened at the Windsor Health Centre in 1976 by Dan’s father-in-law John Gecelovsky. John had been making dentures since the age of 18 and retired at the age of 78. Dan became involved in the family business after marrying John’s daughter Lisa. They moved to Windsor in 1991 where he started working in the Belle River Dental Office with Dr. Peter Courey and the late Dr. Arnie Sysvestre. He then started working at one of the Windsor offices and continued to learn from John. Dan ensures that John’s legacy continues at the three offices. He is committed to ensuring that patients receive the same level of superior service and quality of work that John would have wanted. The main Landry Denture Clinic location recently moved and is now located at 2532 Howard Ave. (just north of Eugenie). The large, modern office is outfitted with lots of natural light and offers a comfortable atmosphere. Patients are already enjoying the easy access and ample free parking. The other clinics are located at 360 Notre Dame St. in the Belle River Dental Office and at 14 Gosfield Townline E. in Essex in the Essex Dental Centre. The friendly staff is dedicated to ensuring that every client has a pleasant and professional visit. Electronic billing and filing is offered at every location and free estimates are always available. Wear your teeth with confidence and get the radiant smile you deserve. You are never too old to invest in implants. One simple visit can change your whole life. Call 519-254-8114 to schedule a consultation. You will be glad you did.